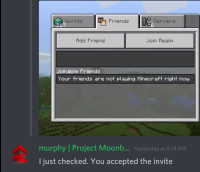 Accepted on a realm, device doesn’t show the invite button. I can’t join the worst realm ever on my iOS device. Murphy (Owner) said that I was allowed according to the server, but on my device nothing would show up. I have tried messing with settings in both minecraft and in Xbox, but nothing changes.